My tour partner Dan Sniffin learned a valuable lesson over the course of our last two tours together. His story is worth sharing as it illustrates a point I make in my presentation, “Discovery & The Creative Choice.” And that is to beware of expectations. Up until the Smoky Tour this spring, Dan has typically arrived with expectations. He might say something like, I want to find a lone tree in fog or I am looking for such and such situation. Then during the tour and even the pre-tour, he would be focused on finding such. This time, as Dan arrived in the Smokies he said to me, “John, I have no expectations on this tour. I just want to relax and whatever happens, happens.” And guess what? Dan produced what I believe to be some of his finest work. And, he produced more “keepers” than on any other tour we’ve done together. Next, he arrived in the Palouse a few weeks ago and said, “John, I’ve shot in the Palouse 10 times, I’m not sure I’ll be doing much shooting. I’m going to relax but if I see something, I’ll get a camera out. If not, thats fine too.” Guess what? Yup, once again Dan produced stellar images and more of them than any other trip to the Palouse. What is the point? By removing expectations and by being open to what was being given to Dan, he was actually able to see more! I would suggest that you don’t try and force images to fit an expectation you have. Rather, just be still and let the images come to you! Beware of those pesky expectations. You know, the expectation to come home from this trip with 10 “keepers.” Or, I saw these killer images of Iceland on 500px. Now I have to go to Iceland to make similar images. These kind of expectations can be dangerous and can potentially influence your “seeing” in a negative way as you’ll be under pressure to succeed against false or unattainable expectations. As evidenced by Dan’s success, it is much better to relax and be open to whatever right answer presents itself. Todays image is from the Palouse. We had been out chasing late light and a storm. We finally stopped on a road where there is a wonderful red barn scene. We waited and waited for the light to come through the thick clouds behind us to light up the barn. Then it came, lasting for less than a minute. The problem for me, was the red barn didn’t have enough clouds above it when the light came. So, I searched for another right answer and found this! I love the streak of gold light and the tremendous clouds. So glad I followed my own advice for once and did not stay focused on the expectation we had of shooting the red barn in last light. Well said. I suggest this applies not only to photography, but to life in general and all that we do. Beautiful shot!! Good blog. Sit back and relax and whatever comes comes!! Love the lesson, thanks for the reminder! My little Daniel is growing up. My eyes are getting misty with pride. You crack me up Chuck. Thank you, Daddy. I love you soooooo much! So so true! Great piece. And a shout out to Dan and his zen photography stance. John, this is exactly the reason why you’ve probably seen me arrive at a location on a tour and just sit there for a few minutes. I’m trying to ignore what I’m seeing, and let myself be guided by what I FEEL instead. And you’re doing a great job with this Eli! Good observation. I have noticed that on many occasions, nature has more surprises in store for us if we just hop on board and go for a ride rather than try to force everything to fit our preconceived notions. Expectations so frequently lay the groundwork for disappointment – whether it is photography, human relationships, other projects, or what have you. Very good point John. Hope all is well. Very true Mike. Your longtime experience and love of nature has served your photography very well. & the corrolary to this great advice is – Don’t have expectations of environments that will NOT have worthy images. Parking lots, offices, intersections (during long red lights), our own living rooms all have opportunities that are worthy at least of one’s photographic consideration. If one accepts Frank’s observation (…applies…to life in general & all that we do), opportunities are literally everywhere. Indeed Marty, it just takes a bit of a paradigm shift in our thinking….or seeing as it may be. 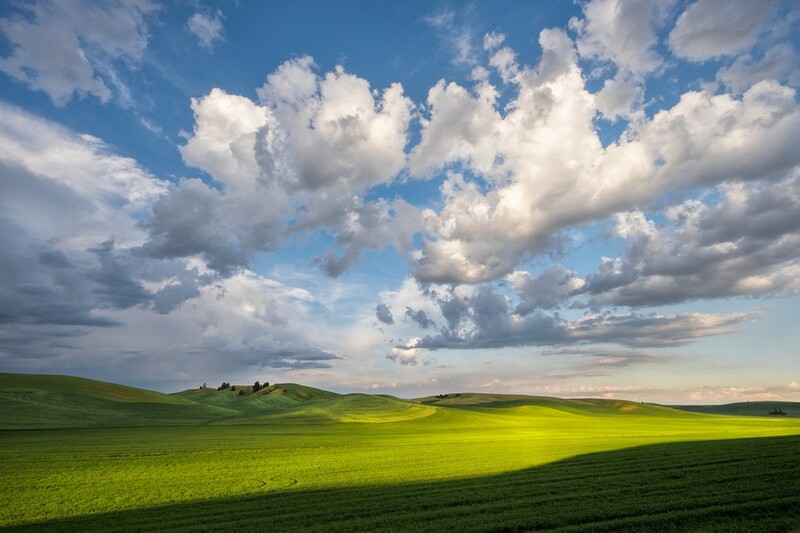 Another awesome image from the Palouse! Looks like you have the seasons, time of year and locations all dialed in, planned correctly and so on … to provide successful opportunities for your workshops. The successful ingredients of knowing your subject, locations and to fulfill expectations of your participants and you as leaders as well. Having “some” expectations allows us to be alert, stay focused and hopefully looking in the right direction, at the right time and having the know how to react or respond appropriately. Knowing that it is impossible to know everything, see everything or to be everywhere at one time provides inspiration for the next trip, the next time and the moments yet to be discovered ahead. Great post and examples of letting go of expectations that blind us in seeing, cause prejudice, conflicts and to simply experience and enjoy the gifts that are presented at the given moments. “Gifts of the present!” Being aware of the present, seeing and appreciating all the gifts before us – whether they are photographed, a conversation or simply a moment to be remembered. There is a fine line to having goals and to achieve what is expected – or not. I have read that Ansel Adams did not expect to capture his “Mona Lisa’s” with each image or in every outing. He took each moment as it came, studied the weather, seasons and lighting, reacted and embraced what he was presented. He was patient, had a sense of humor, was not stressed, embraced the land and respected the preservation of the wilderness. He knew his equipment, he knew his craft, he knew how to work his negatives in the darkroom and to bring his captured visions into life – his ultimate images that became prints. He mnew how to communicate with words. He knew how to communicate with photography, to record and present his visions. Many of his images were never printed and did not receive Ansel’s added master magical touch that he also had in the darkroom. How many of our images are not printed or shared? Do our expectations change as we grow with our craft and mature in mind, spirit and visions? Expectations… We cannot predict the future, but can familiarize ourselves with our subject, the weather, seasons, being open for the unexpected and prepare accordingly so that we can increase the odds and opportunities for success. And, accept failure, mistakes and learn from them rather than being discouraged or disappointed. Disciplines, wisdom, thoughts and practice of photography and art. Well said Stephan. Indeed knowing and refining and working on our craft is critical to this whole concept.